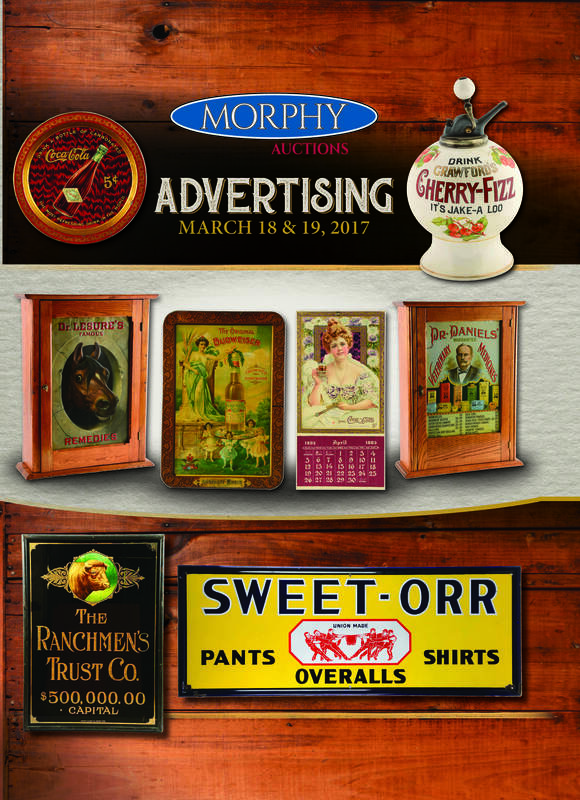 Morphy Auctions’ March Premier Sales Event to Feature a Full Spectrum of Antique Advertising Signs, Displays, Samples, and Ephemera from the Most Desirable Collecting Categories. This two-day auction includes outstanding beverage, travel, consumer products and services, and tobacco related selections, as well as an outstanding collection of antique syrup dispensers. Denver, Pennsylvania, February 4, 2017 – Morphy Auctions, the finest auction destination for fresh to the market collections, is excited to announce this highly anticipated, early spring antique advertising sale event to be held on March 18th and 19th, starting at 9am each day. Almost 1,000 eye-catching and carefully curated lots will be on offer. All selections from this sale are on display in Morphy’s auction gallery and available for preview now. Collectors will certainly be hanging all over this sale’s fantastic selections of antique porcelain and tin litho signage. Lot #817, an Indian Lake, Ohio diecut porcelain sign featuring a handsome Indian in full headdress, is a headliner in this category and is estimated at $6,000-12,000. This very rare example, one of only a few known, is all original and has enormous appeal. Lot #829, a large black, red, and white Sweet Orr rectangular porcelain advertising sign featuring six men having a “tug-o-war” contest with a pair of the company’s pants, may spur a bidding battle with its $2,000-4,000 estimate. It’s “can do” with lot #730, a large Vigo diecut porcelain dog food sign featuring strong colors and a striking graphic of a German Shepherd. This best in show example is estimated at $1,200-2,400. Another crown jewel in this category is lot #346, a King Cole Tea & Coffee door push in beautiful, almost mint condition. It is estimated at $1,500-3,000. And lot #4, “The Original Budweiser” tin litho sign made by The Meek & Beach Company between 1901 and 1905, deserves a toast indeed. Estimated at $7,000-12,000, this very scarce, self-framed example is called “Crowned Everywhere” and features a period graphic of four festively dressed girls holding up an oversized bottle of Budweiser. There’s no need to look backwards on this auction’s great offering of antique reverse painted glass advertising signs. Lot #816, a very unique Ranchmen’s Trust Co. sign, features a colorful image of a bull in the top center with an elaborate gold leaf decoration surrounding it. This great piece, made by the Rawson & Evans Co. from Chicago, is estimated at $12,000-24,000. Lot #2, an Anheuser Busch Faust light up sign in working order, is estimated at $8,000-12,000. This electrifying example, made by The P. Pause & Company from Chicago, features its original curved glass, back metal framework, and trim. And there’s no doubt that lot #819, a John Meier Fine Shoes advertising sign estimated at $2,000-4,000, has heart – and sole. This very ornate example, made by Jos. J. Nager of St Louis, blooms with its floral decorated reverse glass frame. It’s time to hold everything and check out this sale’s great selections of vintage trays, with almost 100 lots on offer. Three from the now closed Schmidt Museum of Coca-Cola in Elizabethtown, KY carry this category. The first, lot #117, a 1903 Coca-Cola bottle 5¢ tip tray, is estimated at $15,000-25,000. This fantastic tray, extremely difficult to find in any condition, is decorated with an early paper label Coca-Cola bottle and was made by Chas. W. Shonk. Collectors will be tickled pink over lot #135, a distinctly feminine 1901 Coca-Cola 5¢ serving tray, estimated at $4,000-8,000. Made by Meek & Beach Co., it features a beautiful girl, pink roses, and a large pink ribbon as part of its illustration. And lot #136, a 1903 Coca-Cola “delicious refreshing” serving tray is just that with its $3,500-5,500 estimate. This auction’s selections of almost 75 fine beverage syrup dispensers is quite satisfying. Lot #417, an extremely rare Fan-Taz dispenser, is simply fan-tastic and estimated at $20,000-40,000. This museum-quality example with strong colors features a baseball motif and includes an original pump. Lot #390, an Indian Rock Ginger Ale syrup dispenser with great graphics, strong colors, and its original and marked ball pump is estimated at $6,000-12,000. Two Grape Julep dispensers will ignite purple passions. The first, lot #408, features a logo on both sides and includes an original style ball reproduction pump. The second, lot #418, is c. 1900, guaranteed to be genuine and authentic, and is the only example known, according to our experts. Each is estimated at $3,000-6,000. Finally, two cherry-themed dispensers are certain to blossom within this category. Lot #416, a Crawford’s Cherry-Fizz syrup dispenser with strong colors and a period pump is estimated at $3,500-6,500. And lot #437, a Fowler’s 5¢ glass version Cherry Smash syrup dispenser in fantastic condition, strong logos, and great colors is estimated at $3,000-5,000. This auction will tempt collectors with a truly unique offering of salesman’s samples and display cabinets. Lot #828, an early sample cultivator in working order, breaks new ground with its $3,000-4,000 estimate. Lot #818, a c. 1900 wood, steel and cast iron Clipper lawn mower model is estimated at $2,000-4,000. It comes with a Johnston Farm Machinery booklet that features an almost identical model within its pages. It’s a mane event with lot #830, a Dr. Lesure’s Famous Remedies wooden display cabinet with its original key and a great embossed tin litho sign of a horse’s face on its front. This equine-inspired rarity is estimated at $2,500-5,000. And lot #831, a Dr. Daniel’s veterinary display cabinet, once offered medical remedies for our favorite four legged friends, including “worm killers,” “perfection hoof dressing,” and “physic ball.” This cure-all is estimated at $2,500-5,000. This sale rounds out with an impressive selection of rare and unusual advertising materials and ephemera. Let the cola wars begin with lot #258, an extremely rare four sized 1909 Pepsi-Cola tin litho straw holder and lot #71, a vibrant April 1903 Coca-Cola advertising calendar. They are estimated at $4,000-8,000 each.